"This soup is a staple for all of us living on the South Carolina coast. Here is my take on the soup that I think is outstanding! Enjoy!" Melt butter in a large stockpot over medium heat. Stir in flour to make a smooth paste, and cook for about 3 minutes, stirring constantly. Mix in the onion, celery, and garlic; season with salt and pepper. Continue to cook and stir for about 4 minutes. Gradually whisk in the half and half cream so that no lumps form. Stir in chicken broth and heavy cream. Bring to a simmer, and pour in half of the sherry. Season with dill, Worcestershire sauce and hot sauce. Cover, and simmer for about 30 minutes, until soup has reduced by 1/3. Add crabmeat, and simmer for another 10 minutes. Ladle soup into bowls, and top off with a splash of the remaining sherry and a sprinkle of fresh chives. Nice recipe. It should be labeled as Crab bisques as there is not "She Crab" in it. 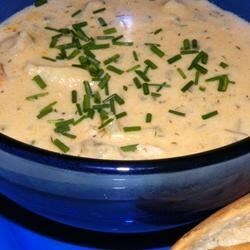 Love this recipe since I am missing the she-crab soup from my fav restaurants in Virginia Beach, tastes just like them! I always add old bay though. This recipe is a perfect tribute to lowcountry fare at its very best.